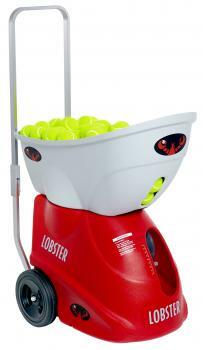 What is the difference in the various oscillation features I see on ball machine models like the Lobster? Older style ball machines fired out a ball to the same spot every time. That ‘s not necessarily a bad thing but eventually it’s going to limit how much more you can improve. Most newer ball machines on the market can spray the ball around the court so now at least you’re seeing shots to both your forehand and backhand side. That’s referred to as oscillation. The best machines on the market allow you to program in shots so that the balls are not only from side to side but also forward and backward in the court. The Lobster can do random oscillations and pre programmed oscillations for drills. The number of different ways a machine can be programmed to oscillate determines the price of the machine. How important is it that a machine can deliver the ball at different speeds and with either topspin or backspin? Think about the various opponents you’ve come across. Some hit just about everything with backspin, which makes the ball stay lower off the bounce. Other players hit with a high degree of topspin, which means the ball is not only dipping down quickly after it crosses the net but it also speeds up and can bounce quite high because of the topspin. Both these types of spins create real havoc for your timing. It would make sense to be prepared for both types of shots by finding a machine that can simulate those spins. As far as speed goes, everything changes when the ball is hit faster. Your timing is the biggest challenge; you have a lot of things to get ready before you make contact with the ball. Practicing at higher velocities is definitely worth doing with a ball machine. Do ball machines ever jam and if so do they have to be sent back for servicing? From time to time all ball machines on the market can jam but it’s a simple procedure to remedy. Different types of balls or ball pressure can cause the ball to get stuck between the throwing wheels, in the feed chute or under the feed wheel. If this happens the machine immediately shuts down with an error message. Each machine comes with instructions on how to clear the ball. Ever had to unjam a photocopier? This is similar but with a ball instead of a piece of paper. Am I better off to train with a ball machine or a real partner? That would depend on a number of factors. How good is the partner at providing consistent shots that allow you to really hone your strokes? How much time and energy does your partner have available? How engaging is your partner in providing feedback and a variety of the drills, all while motivating you to be your best? A ball machine is going to be consistent and tireless with lots of variety of shots. Do battery operated ball machines have any issues? Anything mechanical, whether it’s battery operated or electrical, has the potential for something to go wrong. That’s true for just about every consumer product on the market and will likely never change. Ball machines are pretty reliable but when issues do arise it’s usually something involving the wiring, the battery charger or the battery itself. All machines come with problem analyses guidelines. It might be something as simple as a loose wire or a battery that’s not fully charged. In most cases it can be easily remedied. If I was to train every day and do all the drills available on a Lobster Ball Machine could I go on to play professionally? That’s a difficult question to answer. It would depend on many factors, like your motivation and access to coaching. There are also some innate physical abilities required. Let’s just say some of the best tennis players have spent many hours developing their skills on the court with the help of a ball machine. Names like Steffi Graff and Andre Agassi come to mind.